This conclusion is essential, for it demonstrates the lengths to which Evola not only rejected those who want to separate Islam from the Primordial tradition as something “foreign,” but even that he regarded it as superior in certain aspects to other traditions. So from the outset we must not make the mistake of viewing Islam as a distinct culture, but rather as a filter of cultures that inevitably takes on the vibrant coloring of the people who accept it without detracting any from the message. With this brief but important backdrop to the Islamic tradition, let us now examine how Evola viewed different aspects of Islam. 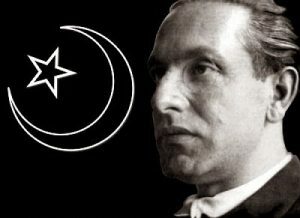 Evola characterized Islam as “a tradition at a higher level than both Judaism and the religious beliefs that conquered the West.”(2) Despite Islam as a message based on the Qur’an and the sunna, or way, of the Prophet Muhammad (peace be upon him) being a relatively recent phenomenon, Evola clearly includes it as a manifestation of Tradition. Sufism is the carrier of the primordial spiritual wisdom, as bounded within the final message of that Tradition which is Islam. The inner wisdom was transmitted by the prophets to gnostic communities, and with the end of the line of prophethood this is now transferred to the spiritual pole of the age, or the qutb. The legend of Khidr can be seen here in a similar light as the “Green Man” who transmitted wisdom to seekers in medieval Europe. (12) As we will see later, Islam and specifically Sufism played an important role in shaping European chivalry. “Such men as the Naqshbandi sheikh Shamil al-Daghestani, who fought a prolonged war against the Russians in the Caucasus in the nineteenth century; Sayyid Muhammad ‘Abdullah al-Somali, a sheikh of the Salihiyya order who led Muslims against the British and Italians in Somalia from 1899 to 1920; the Qadiri sheikh ‘Uthman ibn Fodi, who led jihad in Northern Nigeria from 1804 to 1808 to establish Islamic rule; the Qadiri sheikh ‘Abd al-Qadir al-Jaza’iri, who led the Algerians against the French from 1832 to 1847; the Darqawi faqir al-Hajj Muhammad al-Ahrash, who fought the French in Egypt in 1799; the Tijani sheikh al-Hajj ‘Umar Tal, who led Islamic Jihad in Guinea, Senegal, and Mali from 1852 to 1864; and the Qadiri sheikh Ma’ al-‘Aynayn al-Qalqami, who helped marshal Muslim resistance to the French in northern Mauritania and southern Morocco from 1905 to 1909. It is no accident that these same modernists are generally the same individuals who seek to distort the Sufi Path as not being bounded within orthodox Islam. There is indeed some parallel between Wahhabis and Orientalists who seek to deny that Sufism is founded upon the Prophetic Sunna and the Islamic Shari’a. Sufism is the fulfillment of Tawhid, to purify one’s lower self or ego and to elevate the soul to attain true gnosis, or ma’rifa in the Islamic tradition. One later Sufi who treaded this path of a scholar-warrior, or what Evola would admire as the “asceticism of action,” was the Shehu Uthman dan Fodio of West Africa. He defined the scholar-warrior as the one who lived in simplicity and among the people, like all true zahids (people of asceticism) and awliya (friends of Allah). They walked the path and actually lived the Qur’an through their actions. The Islamic Guilds were based upon futuwwa, and out of this futuwwa grew the tariqas or the orders of Sufism. Many of these guilds were founded by the Caliph An-Nasir and modelled after the character of Imam Ali, the cousin and son-in-law of the Prophet Muhammad (peace be upon him) who served as the fourth caliph. The descendents of the Prophet Muhammad (peace be upon him) through his daughter Fatima and her husband Ali, are called the Ahl al-Bait (people of the Household) and hold a special place within Islam. In addition to his prophethood (nubuwwa) and receiving revelation (wahy), the Prophet (peace be upon him) also possessed the spiritual guidance and initiation (walaya) which he transferred to his Household. This is why the spiritual lineage, or silsila, of nearly all the major Sufi tariqas are transmitted from the Prophet Muhammad (peace be upon him) through Ali and the Household. The earliest Sufi ascetics surrounded themselves with the company of the Household. This is what Evola would consider a true chain of orthodox initiation. The perfect combination of physical heroism on the battlefield with a sanctity wholly detached from the worldly life, was personified in the character of Imam Ali. The Qur’anic verse, “You did not kill them; it was Allah who killed them; and you did not throw, when you threw; it was Allah who threw”(40), was revealed during a battle when the Prophet Muhammad (peace be upon him) threw a handful of dust towards the enemy. “He said, ‘I am wielding the sword for Allah’s sake, I am the servant of Allah, I am not under the command of the body. “I am the Lion of Allah, I am not the lion of my passion: my deed bears witness to my religion. “The relationship between the ‘greater’ and the ‘lesser holy war,’ however, mirrors the relationship between the soul and the body; in order to understand the heroic asceticism or ‘path of action,’ it is necessary to recognize the situation in which the two paths merge, ‘the lesser holy war’ becoming the means through which ‘a greater holy war’ is carried out, and vice versa: the ‘little holy war,’ or the external one, becomes almost a ritual action that expresses and gives witness to the reality of the first. Originally, orthodox Islam conceived a unitary form of asceticism: that which is connected to the jihad or ‘holy war’. Just as with the role of Islamic mysticism in transmitting ancient Indo-European chivalry, so too did Evola see in jihad a “late rebirth of a primordial Aryan heritage,” such that “the Islamic tradition serves here as the transmitter of the Aryo-Iranian tradition.”(54) There is mention of this reality of the inner struggle in the verses of the Bhagavad-Gita: “Know Him therefore who is above reason; and let his peace give thee peace. Be a warrior and kill desire, the powerful enemy of the soul”(Bhagavad-Gita, 3:43). Throughout the Qur’an, the verses about striking against the enemies and maintaining the upper hand are presupposed on the verses about sacrificing the illusions of this worldly life for the truth of the struggle. The Hereafter is regarded as the ultimate destination, and those who fall in battle are promised heavenly rewards so long as their intention was pure and they fought within the balance and justice of Shari’a. The current author makes reference to his attachment to the faith of Islam, although he remains proud of his European descent. There is no contradiction in the two, but rather through recapturing the essence of Islam that is primordial and a cultural filter, in every sense of the word it is valuable as an internal aid for spiritual awareness that allows him to hold onto the primordial traditions of his ancestors at the same time. We have focused in Tasawwuf as the latest expression of the timeless spiritual wisdom that was always transmitted through the ages to sincere seekers, usually in the midst of fierce opposition. The way of Islam is the final expression of the previous messengers who were sent to Indo-European nations and tribes, just as the reality of Tasawwuf is further the way of those communities of gnostics and mystics who protected the spiritual wisdom. Just as these communities were responsible for the best of European art, architecture, literature, chivalry, and music, so too will it be left to a core vanguard of devoted men and women – European in blood, Islamic in faith, Sufi in devotion – to continue planting the seeds of a new Indo-European renaissance. We will do so infused with the doctrines of the Qur’an and its accompanied spiritual wisdom, and through it recapture the essence of what was lost from our primordial traditions. (1) Claudio Mutti, “Islam in the eyes of Julius Evola,” February 11, 2007, <www.claudiomutti.com/index.php?url=6&imag=1&id_news=130>. (2) Julius Evola, Revolt Against the Modern World, Rochester, Vermont: Inner Traditions International, 1995, p. 245. (3) All verses are from the interpretation of the meaning written by Abdalhaqq and Aisha Bewley, The Noble Qur’an: A New Rendering of its Meaning in English, Norwich, UK: Bookwork, 1420/1999. (4) Qur’an, Sura Al-Hujurat, 49:13. (5) Qur’an, Sura Yunus, 10:47. (6) Qur’an, Sura Al-Anbiya, 21:107. (7) Revolt Against the Modern World, p. 244. (8) A popular tradition holds that Adam first built the Ka’aba but it was destroyed, until the Prophets Abraham and Ishmael later rebuilt the foundations. In this sense, not only is the Ka’aba primordial but also a reflection of the so-called “Abrahamic tradition” and thus its location as a place of worship predates its current status within Islam. (9) Makka is identified in the Bible as being in “the wilderness of Paran” (Genesis 21), and as the place where Abraham built a “House of God” (Genesis 35:15, 28:18). The Prophet David speaks of “Bakka” (Psalm 84:6), a parallel noted in the Qur’an (Sura Al-Muddaththir, 74:1-3). (10) Ian Dallas, The New Wagnerian, Freiburg Books, 1990, p. 171. (12) Pierre Ponsoye, L’Islam et le Graal: Étude sur l’ésoterisme du Parzival de Wolfram von Eschenbach, Paris: Donoel, 1958. (13) Qur’an, Sura Al-A’raf, 7:172-173. (14) Shaykh Riyadh ul Haq, al-Tajrid al-Sarih, Lesson 7. (15) Revolt Against the Modern World, p. 244. (16) Umar Ibrahim Vadillo, The Esoteric Deviation in Islam, Cape Town: Madinah Press, 2003, p. 332. (17) Dépêche tunisienne, 10th February 1913. (18) Revolt Against the Modern World, p. 244. (19) Shaykh Nuh Keller, Reliance of the Traveller: A Classic Manual of Islamic Sacred Law, Beltsville, Maryland: Amana Publications, 1997, p. 863. (20) As on so many issues, there are more commonalities than differences between the Islamophobes and Wahhabis. Each have a monolithic view of Islam that denies its true inner spiritual realities, by turning it into an ideology and presenting an interpretation of Islam that contradicts the classical scholarship upon which this faith has been sustained. The Qur’an is the perfect remedy to both these maladies. (21) Revolt Against the Modern World, p. 244. (22) James Fadiman and Robert Frager, Essential Sufism, San Francisco: HarperSanFrancisco, 1997, pp. 12-13. (23) Revolt Against the Modern World, p. 244. (24) Evola, Gli uomini e le rovine, Roma: Edizioni Settimo Sigillo, 1990, p. 41. (25) “Interview with Claudio Mutti,” Junges Forum, no. 3, January 2005, <http://www.regin-verlag.de/index.php?id=3,12,0,0,1,0>. (26) Evola, The Mystery of the Grail: Initiation and Magic in the Quest for the Spirit, Rochester, Vermont: Inner Traditions/Bear and Company, 1997. (28) Ian Dallas, The Interim is Mine, Cape Town: Madinah Press, 2010, p. 54. (29) Titus Burckhardt, Moorish Culture in Spain, London: Allen & Unwin, 1972, p. 93. (30) Quoted in Roger Boarse, The Origin and Meaning of Courtly Love, Manchester, UK: Manchester University Press, 1977, p. 20. (31) The Mystery of the Grail, p. 150. (32) Evola, Metafisica del sesso, Roma: Edizioni Mediterranee, 1969, pp. 256-257. (35) ibid., pp. 108-109, 288, 345. (38) Shaykh Mawlay al-Arabi ad-Darqawi, The Darqawi Way, Norwich, UK: Diwan Press, 1979, p. 179. (39) Shaykh Dr. Tahir-ul-Qadri, The Ghadir Declaration, Lahore: Minhaj-ul-Qur’an Publications, 2002, pp. 5-10. (40) Qur’an, Sura Al-Anfal, 8:17. (41) Reza Shah-Kazemi, “Recollecting the Spirit of Jihad,” in Islam, Fundamentalism and the Betrayal of Tradition, ed. Joseph Lombard, Bloomington, Indiana: World Wisdom, 2004. (42) Hindu Scriptures, trans. R.C. Zaehner, London: Dent, 1966, p. 256. (43) The Mathnawi of Jalalu’ddin Rumi, trans. R.A. Nicholson, London: Luzac, 1926, book 1, p. 205. (44) Quoted in M.R. Bawa Muhaiyaddeen, Islam & World Peace: Explanations of a Sufi, Philadelphia: The Fellowship Press, 1987, pp. 82-83. (45) Cited in Abd al-Wahid Amidi, Ghurar al-Hikam, Qom, Iran: Ansariyan Publications, 2000, 2:951, no. 9. (46) Ibn Hajar, Takhrij Ahadith al-Kashshaf, p. 114; and Al-Ahdab, Zawa’id Tarikh Baghdad, 9:309-311, no. 2077. Also, the more recent scholars of hadith such as Shaykh Ahmad al-Ghumari, Tahsin al-Khabar al-Warid fil-Jihad al-Akbar; and Shaykh Abd al-Fattah Abu Ghudda, margin notes on al-Lacknawi’s al-Ajwibat al-Fadila, p. 156. (47) Qur’an, Suras Al-A’raf 7:176, Al-Furqan 25:43, Al-Ankabut 29:6, 69, Al-Nazi’at 79:40-41, and Ash-Shams 91:7-10. (48) Ibn Hibban, nos. 1624, 2519; Tirmidhi, Ahmad, al-Hakim, and Tabarani. (49) Ibn Hajar Al-Haythami, Majma’ al-Zawa’id. (51) Mutti, “Islam in the eyes of Julius Evola,” op. cit. (52) Revolt Against the Modern World, p. 118. (54) Evola, The Metaphysics of War, Integral Tradition Publishing, 2007, p. 96. (55) Revolt Against the Modern World, p. 137. (57) Evola, Introduzione alla Magia, a cura del Gruppo di Ur, III, Roma: Edizioni Mediterranee, 1971, p. 281. (58) ibid., I, pp. 396-397. (59) Evola, Oriente e Occidente, Milano: La Queste, 1984, p. 212. (60) Evola, Ricognizioni. Uomini e problemi, Roma: Mediterranee, 1974, p. 50. (61) Introduzione alla Magia, a cura del Gruppo di Ur, I, p. 71.